New tool easily creates UML sequence diagrams from markup entered in Lucidchart. The tool is simple, intuitive and perfect for generating sequence diagrams that adhere to industry standards. 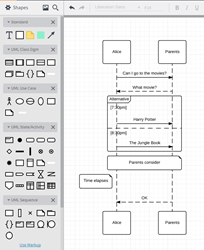 Lucid Software, the company behind the best-selling online diagramming app Lucidchart, today announced the release of the UML Sequence Markup tool as a feature now available in Lucidchart. The new tool enables quick and easy diagram creation. Instead of constructing a diagram from scratch, users can now generate complicated UML sequence diagrams by simply typing the markup directly into Lucidchart. The UML Sequence Markup editor instantly creates diagrams from text alone. UML sequence diagrams made in Lucidchart are living documents; markup can be edited or added anytime without the need to start over or change formatting. Users can easily customize their UML sequence diagrams with the extensive formatting capabilities of Lucidchart. UML shapes can be dragged right from the shape library onto the diagram. UML shapes, lines and text can be placed exactly where they’re needed with just a few clicks. The collaborative UML tool enables teams to work together in real-time, without downloads or software updates. UML diagrams can be easily published as web pages, images or PDFs. Cloud-based Lucidchart is fully integrated with Google Apps, Microsoft Office 365, Atlassian Confluence, JIRA and HipChat, Jive, Slack and other workforce productivity tools. Lucid Software helps companies and individuals solve complicated problems through its cloud-based visualization apps. Lucidchart, a diagramming application, and Lucidpress, a design solution, are utilized by over six million users, including Comcast, Dropbox, NASA, Netflix and Xerox, making them two of the most popular productivity apps on the web. Since the Utah-based company’s founding in 2010, Lucid Software has grown in revenue by over 100 percent each year and has received numerous awards for its business and workplace culture. For more information about Lucid Software, visit http://www.golucid.co.